Is it Your Printer or Your Paper? 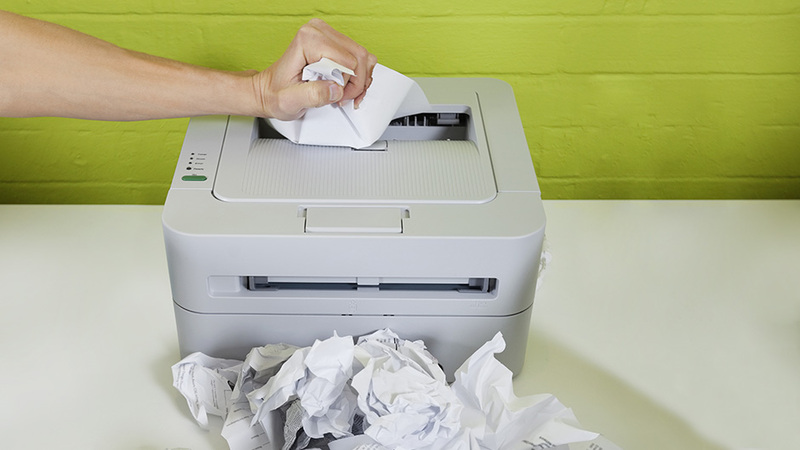 Did you know that when your printer jams, chances are it’s the paper not the printer? Paper jams waste time and paper while interrupting your workflow and adding stress to your day. Many people assume that the problem is with the printer and that can be an expensive problem to solve. But our testing of many brands of paper has shown that paper jams are often caused by something more basic. If you are experiencing paper jams on a regular basis here’s a simple trick that can get you back on track. The first thing to do when you experience repeated paper jams is switch the paper. We recommend using a fresh ream of Hammermill™ paper because of our 99.99% Jam-Free® Guarantee. You’d be surprised how often this solves the problem. Cheap paper can end up costing you more in the long run. That ream of bargain-priced paper saves you a few pennies up front but can cost you more, with wasted paper and time wasted clearing paper jams, while giving you poor printing results. Cost-cutting measures that keep the paper cheap can also mean it doesn’t work well with your printer. The small difference in cost of using quality paper like Hammermill ends up saving you time with trouble free printing that gives you great-looking results, every time. That’s why Hammermill paper ends up being a better value.